Experience horse riding, golf, the spa and luxury at one of Ireland’s oldest sporting estates, as featured on Equitrekking on PBS. Enjoy 1500 acres of parkland at the two centuries old Irish estate, which is now a member of the Small Luxury Hotels of the World. Equitrekking Travel's Mount Juliet equestrian vacation packages offer activity options for equestrians and their non-riding companions. The Estate itself was a private residence until 1987 and has a long and interesting history, including a rich equestrian heritage. For almost two hundred years it was home to The Earls of Carrick. In 1914 the estate was sold to the McCalmont family. Ballylinch Stud, a successful Thoroughbred-breeding farm, was founded by Major McCalmont as a base for his championship racehorse, The Tetrarch. The family enjoyed great equestrian success at Ballylinch Stud and developed several influential stallions. During their time, a total of eleven classic winners were bred at Ballylinch. The great equine history is still honored at Mount Juliet – the bar in the main house is named after horses bred at Ballylinch Stud – The Tetratema and The Caretaker. Have afternoon tea and scones while enjoying views of Ballylinch Stud, the River Nore and Ireland's lush green pastures from the main estate house. On the estate, there are 16 miles of bridle paths and an exciting cross-country schooling field, which houses twenty-four jumps and a water complex. Mount Juliet’s Equestrian Center prides itself on tailoring each equestrian vacation to suit each individual’s requirements. You'll be matched with a strong, Irish mount to fit your skill level and personality. This, coupled with Mount Juliet’s well versed British Horse Society approved instructors, provides guests with a truly unique and personal equestrian vacation. Mount Juliet’s state of the art equestrian center contains two arenas (43m by 26m and 60m by 30m) and has the ‘Premier Cushion Track’ surface, which enhances performance. The clean, well ordered American Barn contains eighteen large stalls and four pony stalls. 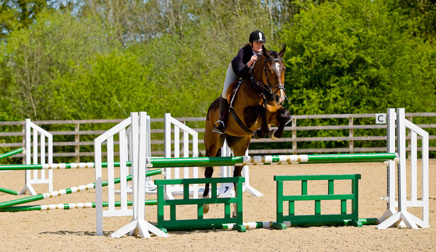 Throughout the year Mount Juliet hosts an exciting range of equestrian master classes. These master classes have been designed to cover many different aspects of horseback riding from show-jumping to cross country training to hunting. Besides equestrian sports, Mount Juliet also has many activities for your non-riding companion including a championship Jack Nicklaus Signature golf course, clay target shooting, a fitness center with an indoor pool, archery, fly fishing, tennis, croquet, a putting course, cycling and the spa. In addition to exceptional riding and golf, Mount Juliet offers several Craft Trails including Nicholas Mosse Pottery, Jerpoitn Glass and Chasneau Leather. There are historic area attractions like Jerpoint Abbey, Black Friar Abbey, Kilkenny Castle and Rothe House. The small, nearby towns of Kilkenny and Thomastown offer atmospheric pubs, craft shops and history. Mount Juliet Estate evokes old fashioned graciousness – a haven of peace with outstanding service and staff, top notch cuisine and a range of accommodations. Dining on the estate is an experience with the finest cuisine prepared using homegrown herbs and vegetables from the estate’s own herb garden. Featured in Equitrekking’s Emmy award winning series in the season two: the Equitrekking Irish Countryside episode. The acclamation from Tiger Woods that Mount Juliet presented "perfect fairways... and the best greens we have putted on all year" was rich embellishment of the stature of Ireland's leading championship parkland golf course. Mount Juliet Golf Club hosted the 2002 and 2004 American Express World Golf Championships, which were won by Tiger Woods and Ernie Els. Mount Juliet has also held 3 Irish Open Championships. Lady Helen Restaurant was awarded the 2 AA Rosette Award. Please see Equitrekking Travel's Packing List. We recommend rain gear and layered clothing for any riding in Ireland. At the Mount Juliet Equestrian Centre, guests enjoy a selection of well-schooled horses of varying breeds, some of which include, Irish Draught, Connemara and Thoroughbred crosses. These Irish horses are well trained for various disciplines including cross country, jumping and gentle hacks. There is plenty to do when you visit Mount Juliet, including a wide range of indoor and outdoor activities. There’s horse riding and angling and fishing on the River Nore. You can also enjoy clay pigeon shooting, archery, the leisure centre including a high-tech gym, swimming pool and sauna / steam rooms. If all that is too much, there are a variety of walks and trails through the estate, which you may take at your own pace. Families really enjoy the 18-hole par 53 putting course. Holes are up to 36 yards in length with bunkers and water hazards. At the spa, the unique Softime dry flotation experience and treatments including reiki and reflexology are main attractions, as well as manicures and massages. Families may enjoy these activities as well as the daily supervised kids club, Little Rascals, which runs from 10am to 4pm, Monday to Friday. This includes a packed lunch and light evening snack. On the boundaries of the estate is Ballylinch Stud, where the McCalmont family, bred many world famous racing horses including The Tetrarch, once known as "the fastest horse in the history of the turf". The breeding tradition continues today, and hotels guests are invited to enjoy a personal tour of the stud during their stay. At the right time you may be lucky to see the birth of a future champion. Alternatively the hounds of The Kilkenny Fox Hunt, which are kenneled on the estate, are available to walk most mornings. Depending on the time of your visit there may be a horse show or competition taking place in the area. This is a great opportunity to see the talents of local competitors and to lend your support. Regular monthly horse sales are held in the nearby town of Goresbridge. After the pleasures of riding at Mount Juliet, you may want to purchase an Irish mount of your own! American Barn: The American style enclosed barn (11.5 meters x 38.6 meters) has stunning hardwood walls, concrete floors and a rustic appearance and blends in well with the surrounding environment. The barn is comprised of 18 loose boxes and 4 pony boxes. Arenas: The smaller arena (26 x 43 meters) and the larger International size arena (30 x 60 meters) both use advanced riding surfaces for improved performance. The equestrian team at Mount Juliet uses the highest grade cushion track premier surface, similar to that used in the international warm up arena at the Royal Dublin Horse Show & Kill Equestrian Centre, international competition arenas. All of these ingredients create a quality footing wholly sympathetic with the horse, maximizing the experience for both horse and rider. Show-jumps: The show-jumps aim to cater to all levels from novice to advanced horse and rider, from schooling fences to competition courses. Training sessions can be made more interesting for rider and horse with bright new colorful jumps and courses. Golf: The Mount Juliet Golf Club is a Jack Nicklaus designed golf course set in a world of its own, on lush parkland in the south east of Ireland, and only 20 minutes from Kilkenny. Ireland has long being known as one of the top golf destinations in the world, and Mount Juliet is a destination every golfer wants to visit. The acclamation from Tiger Woods that Mount Juliet presented "perfect fairways... and the best greens we have putted on all year." was rich embellishment of the stature of Ireland's leading championship parkland golf course. Mount Juliet Golf Club hosted the 2002 and 2004 American Express World Golf Championships, which were won by Tiger Woods and Ernie Els. Mount Juliet has also held 3 Irish Open Championships. Spa: The Ultimate in pampering and rejuvenation, Mount Juliet’s luxury Spa provides the perfect escape from the stresses and strains of modern living. The Spa, which uses the prestigious ESPA range of products and also SpaFind natural mineral therapy products to offer traditional and alternative health and luxury beauty treatments in a discreet and luxurious environment. Mount Juliet Spa is complemented by a fully equipped Health Club including a 15 meter swimming pool, sauna, steam room and gymnasium. You may also try a new spa treatment, the softime float experience, with soothing heat and gentle vibration it encourages an incredible state of relaxation for both body & mind. Gowran Races. Local Shows during the Summer months. There are 31 bedrooms at Mount Juliet House, including two presidential suites. Mount Juliet House is a historic Georgian Mansion with modern amenities overlooking the River Nore and Ballylinch Stud, where horses graze on lush green fields. Each hotel room is individually designed, in keeping with the concept of a private, family home. Each room is also named, drawing inspiration from the history of the estate. In the evening as you prepare for dinner, the beds are turned down, the lamps are lit and the drapes drawn. The Rose Garden Cottages are a great option for families who visit Mount Juliet or those who'd like an extended stay at the estate. With a clean Irish design, these cottages provide modern comfort including a fully-equipped kitchen, two bedrooms with private bathrooms, dining area, large flat screen TVs, ipod docking stations and more-- all near the private rose gardens. The epitome of gracious living, Mount Juliet is the perfect spot to experience Irish cuisine under all its forms. There are various restaurants from which to choose during your stay and several bars including the dark, wood paneled equestrian themed Tetrarch Bar. Try a simple and satisfying bite to eat in at the all day dining option, the President's Bar. Enjoy soups and salads, snacks and an extensive charcoal grill menu throughout the day. The President’s Bar has an informal and kid friendly service with views of the golf course. Kendals is the ideal spot for comfort food in a warm atmosphere. Try French brasserie classics in a refined yet informal setting. Kendals is located in The Club House, which is located in the estate's converted stables. Lady Helen restaurant enjoys panoramic views over the estate and the River Nore. They serve a variety of international dishes prepared using local produce and fresh herbs, picked daily from the estates own herb garden. Gourmet dining and superb service are complemented by the opulent ambience of dining in the Lady Helen and a compelling wine list. The restaurant was awarded the 2 AA Rosette Award. Alcohol is available in the restaurants at Mount Juliet and The President’s Bar. Mount Juliet’s ideal traveler is someone interested in brushing up on their riding skills or learning to ride. More advanced riders might like to try foxhunting, jumping or cross country. Non-riding companions with an interest in golf, fishing, other sporting activities or just enjoying area attractions from the base of a refined Irish resort, will find much to do at Mount Juliet. Mount Juliet is appropriate for families. There's a daily supervised kids club, Little Rascals, which runs from 10am to 4pm, Monday to Friday. This includes a packed lunch and light evening snack. Mount Juliet estate offers sixteen miles of professionally planned bridleways. Here you can take the stunning views from the ideal vantage point of a saddle while passing through mature, unspoilt parkland. Each season has something different to offer from the blankets of bluebells in the Spring to the green canopy provided by mature beech and oak trees in the summer. With the freedom of 1500 secluded acres to enjoy, Mount Juliet provides an exhilarating equestrian experience which visitors never forget. Your riding itinerary will normally be sent with your booking confirmation. Please note that the itinerary may change depending on the weather at the time and other local conditions. The regular riding vacation includes three hours riding for each night's stay. Additional hours can normally be added and paid for locally (but are subject to availability). Starting at $2381 USD* for 4 nights, double occupancy room in the Hunters Yard midweek and includes 3 hour rides of either lessons or trail rides tailored to the rider’s ability. Longer stays are encouraged. Please call or email to discuss your requirements. * Prices shown are subject to daily exchange rate fluctuations. Payment by credit card, fees may apply. Weekend supplements apply. Please note that Mount Juliet closes on Sunday, Monday and Tuesday nights during low season (November, January, February and March). Nearest Airport: Waterford or Dublin. One of Europe’s great sporting estates, Mount Juliet’s fifteen hundred acres of gardens, woodland, rolling fields, and sculpted decadence stand out amid the countryside of County Kilkenny in southeastern Ireland. To ride at this grand eighteenth-century country estate is to ride in the footsteps of eccentric earls and ladies, lavishly dressed members of high society, and the famous racehorses that were born and bred here. As one of the few intact estates in Ireland, Mount Juliet is a special reminder of a bygone era. My heaven on earth! We stayed for 10 nights in the Lady Mary room - this was our second visit the one the year prior was in the Lady Margaret room- both rooms were fabulous! This place is so full of history, haunted with good reason why ever would anyone wish to leave it? We ate almost all of our meals in the bar area of the golf clubhouse- good quality food. Superb breakfasts each morning. The main reason for my trip was to ride throughout the estate grounds and the experience was wonderful. The staff and horses we now consider our dearest friends- they all took such good care of us. Hotel was gorgeous. Lots of different areas to sit and chat. Warm and friendly. The rooms were spacious and if you can go the extra, choose a room overlooking the river. The food in the restaurant was excellent and the portions were perfectly sized. Variation on the menu to suit all tastes. The staff couldn't have done more...they were superb. There are wonderful walks around the grounds and my only regret was that we didn't arrive earlier and leave later so we could avail of the walks. Next time we will organise our time better. I would highly recommend this hotel. English style saddles. Dressage saddles are available for flatwork lessons. Walk, trot, canter- depending on skill level. Irish Draught, Connemara and Thoroughbred crosses. May & September are usually the best months weather-wise, though Mount Juliet is open year-round.